“Bats have it tough right now. Not only are they suffering from habitat loss, but the disease white-nose syndrome (WNS) is wiping out entire bat populations. 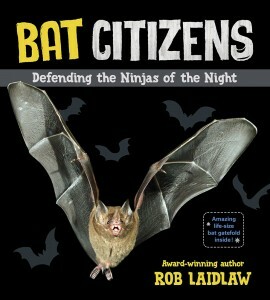 To help these important and fascinating animals we need to learn more about them and Rob Laidlaw’s book Bat Citizens: Defending the Ninjas of the Night provides lots of interesting information…. “Because bats are a favorite topic for many young readers, there’s always room in the marketplace for another book, especially one that is comprehensive, based on the latest data, and written in an appealing, kid friendly style…. 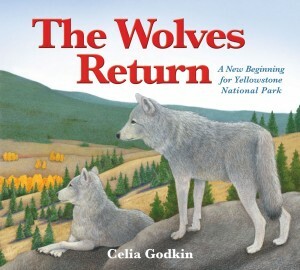 Scientific information is presented in a direct, easy to read manner throughout, with sufficient detail to answer most questions young readers might have…. [B]ecause bat populations are being decimated by White Nose Syndrome, readers learn about the latest research. To help with the loss of habitat or disturbance, readers read how concerned citizens are providing bat roosting boxes, prohibiting people from entering old mines and caves, and most interesting, researching ways to protect bats from wind turbines that kill millions….Since bats have long been given a bad rap, everything in this book is aimed at dispelling the myths…. The book profiles 11 kids, starting as young as four, with life long interests in bats and ambitions to be involved in the solutions to their conservation. Arming these kids with today’s technology is resulting in new data collection. They are terrific ambassadors whose dedication to the cause will inspire readers to think about their own interests and aspirations in science fields. The orderly layout of the book will engage readers and leave a strong impression. The main text, with large bold subheadings, occupies the centre of each double-spread, framed on each side and along the bottom with many well chosen, captioned photos and sidebars. An exciting surprise awaits mid book: a huge foldout diagram of a Hoary Bat with key body parts labelled. 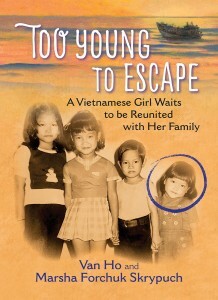 The same poster graces the reverse of the cover. That cover, by the way, is striking for its matte black finish with glossy silhouettes and large bat flying towards you. This is a most visually appealing book! Bat Citizens’ contents should readily satisfy the bat curious.